Tight security is in place as airlines start to bring home Britons stranded in Egypt's Sharm el-Sheikh. The UK government cancelled flights to and from the resort on Wednesday amid fears a Russian passenger plane had been brought down by a terrorist bomb. Only hand luggage will be allowed on flights, with hold baggage being transported later by the government. UK investigators believe a bomb was put in the hold of the Metrojet Airbus A321 before take-off, the BBC has learned. The government says it received a crucial new piece of intelligence on Wednesday, which the BBC understands was based on intercepted communications between militants in the Sinai. The Russian aircraft was flying from Sharm el-Sheikh to St Petersburg last Saturday when it crashed in the Sinai desert, killing all 224 people on board. Easyjet, Monarch, Thomson, Thomas Cook and British Airways have scheduled UK-bound flights from mid-morning local time for some of the estimated 19,000 British nationals on holiday in Sharm el-Sheikh. But Easyjet says its flights to Luton and Gatwick due to depart at 11:00 GMT have been delayed "due to congestion within the terminal building in addition to additional security procedures in place". Could IS have bombed Flight 9268? How has airport security changed? There will be additional security measures for passengers, put in place by British security officials who have assessed the airport. 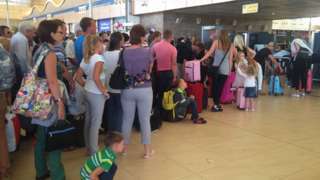 Queues were reported to be building up in the departure area of Sharm el-Sheikh airport where Britons are being asked to complete a form for each piece of hold luggage as they arrive to check in. British tourist Kate Dobbs in told BBC Radio 4's Today programme she hoped to be on one of the flights returning to the UK later. Passengers on her flight have been told they can bring up to 5kg of hand baggage, she said. "They've given us a list of the kind of thing we can take - phones and keys, that type of thing." Ms Dobbs added: "There are lot's of anger among some people although the majority... are like us. We understand we need to get home safely and that's the way in which they decided they are going to do it." Transport Secretary Patrick McLoughlin told the BBC UK security officials were at the airport monitoring the baggage screening process. He said reports the luggage would be transported back to the UK by the RAF was incorrect but the government was making arrangements to ensure it would be returned to passengers in a week to 10 days. He said more than 20 flights would be leaving the resort later and the "vast majority" of British tourists who "should have come back Wednesday, Thursday and Friday... will be back by tonight". Outbound flights from the UK to Sharm el-Sheikh remain suspended and the Foreign Office continues to advise against all but essential travel by air to or from Sharm el-Sheikh airport. Egypt's tourism industry has suffered in the unrest after the Arab Spring in 2011, but the Red Sea resorts including Sharm el-Sheikh have remained popular and hundreds of thousands of Britons said to visit the area every year. Mr McLoughlin told the BBC: "We don't have any problems with the safety of the resort itself but we are concerned about flights into Sharm el-Sheikh." He said the restrictions on hold luggage and the suspension of UK passenger flights into Sharm el-Sheikh would stay in place "until we've got longer-term assurances about the security at the airport". Flights are scheduled to leave Sharm el-Sheikh for Glasgow, London Gatwick, London Stansted, Luton, Birmingham and Manchester on Friday. Thomas Cook has listed two flights to Birmingham and London Gatwick. Media captionHow important is tourism to Egypt's economy? BBC security correspondent Frank Gardner says that although British officials have not ruled out the possibility of a technical fault bringing the plane down, they think that is increasingly unlikely. Investigators in the UK's security service suspect someone with access to the aircraft's baggage compartment inserted an explosive device inside or on top of the luggage just before the plane took off, our correspondent adds. Prime Minister David Cameron said on Thursday it was now "more likely than not" that a terrorist bomb caused the crash. But both Egypt and Russia say its too soon reach such a conclusion. It came as he held talks with Egyptian President Abdul Fattah al-Sisi in London during a previously scheduled visit. President Sisi, told reporters security at the airport was tightened 10 months ago at the UK's request. He said British experts had then assessed security at Egyptian airports and found the measures were "good enough". Mr Cameron also discussed "joint counter-terrorism" with Russian President Vladimir Putin during a telephone call. Media captionWere Islamic militants behind Sinai crash? The Egyptian head of the team investigating the Sinai plane crash says it is too early to say what caused it, despite reports of a "violent explosion".